One of K.R. Kent's first priorities when he becomes Ford Motor Co.'s executive director of investor relations next month will be to help regain an investment-grade credit rating. Kent, 48, is currently CFO at Ford Motor Credit Co. He will be succeeded in that position on Jan. 1 by Michael Seneski, 45, controller for global sales and marketing. The automaker fell into junk status in 2005 and remains four levels below investment grade, according to Standard & Poor's. When it lifted Ford's rating two notches in August, S&P cited risks that included a fragile economic recovery in the United States and weak demand in Europe. An investment-grade rating may eventually lower the cost of funds for Ford Credit. In turn, that could make it cheaper for the captive finance arm to offer incentives, and lower the rates at which Ford and Lincoln dealers offer loans and leases. In March, CFO Lewis Booth told Bloomberg that Ford has “a lot of steps to go before we get to investment grade.” Ford, which ended three years of losses totaling $30 billion last year, needs to show “consistent and predictable” improvements, Booth said. 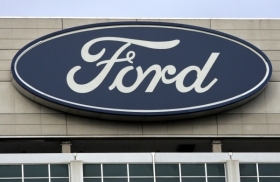 The cost of funds has become a competitive issue for Ford Credit since rival Ally Financial, the former GMAC, became a bank holding company in late 2008. That gives Ally access to customer deposits, a cheaper source for funding new loans. Ford Credit had a cost-of-funds advantage over Ally in 2009 until the second quarter of that year. Since then, Ally has been able to borrow more cheaply than Ford Credit.